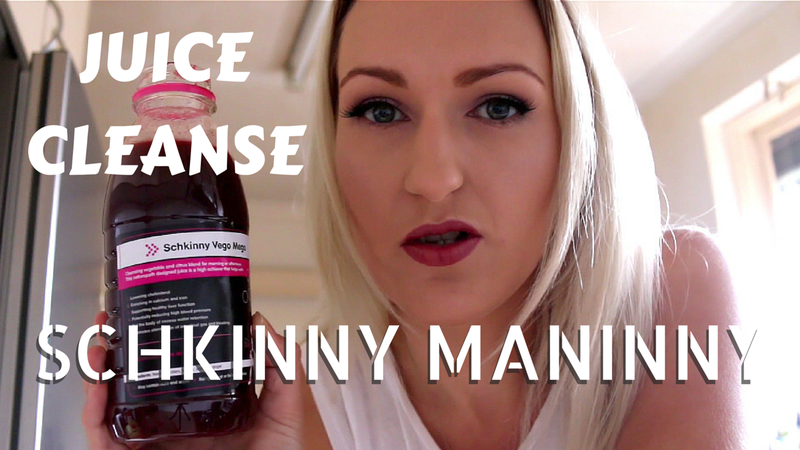 The following video showcases my experience with the Schkinny Maninny Just Juice Cleanse, it's a bit of a long video but it really delves in to the good, the bad and the ugly of juice cleansing. Schkinny Maninny offer a home delivered juice cleanse customised to suit your needs, they include low fruit options, Juice and Dinner, Juice and Soup and a wide array of duration options. Juices are delivered to your door daily (very early) and your first day includes a little bag of extras to compliment your cleanse. This is a great option for those who lead a busy lifestyle and would like the convenience of a home delivered cleanse. I had a horrible sleep the night before and slept half the day away but the enthusiasm for the juice cleanse was real, I eagerly opened my box of juice and started to down my first juice while inspecting everything and placing my other juices in the fridge. Each day has a set menu, it can vary depending on availability but Tuesday was by the book for me. Water Frog, Leap Frog and Green Salad are all green juices, Water Frog tastes like the white rind of a watermelon while the other two taste distinctly of cucumber. Pink Sherbert tested my resolve, this one was like bitter cucumber, I couldn't stomach the lemon. I was already having trouble keeping the juices down, my body was screaming for caffeine and sugar and I was battling a headache, so by the time I opened the Rocky Orange Show I was praying for sweetness but again it had a predominant cucumber flavour to it. I was having some major head hungry issues by the time 'dinner' rolled around and Sleep Tight really hit the spot, I was hoping the dates would add sweetness but it's very subtle, the nut milk was however, very filling so it hit the spot that I desperately needed and I felt really full, so full that I couldn't finish the whole bottle. Remainder went in the fridge for 'emergencies'. I slept for about 12 hours, it was a deep sleep that I struggled to come out of but my headache was gone. I wasn't hungry when I woke up so I slowly sipped through Leap Frog. I took Alkaliser out with me to visit Nan but was wary of the name so I also popped my left over Sleep Well in my bag. Praise Jesus. One sip of Alkaliser brought on nausea, I simply couldn't stomach it. I was grouchy and felt a little disjointed from reality so I listened to my body, put Alkaliser aside and slowly sipped on the remaining Sleep Well, I felt a little 'heavy' for an hour or so but it stopped the hangry feeling and kept me calm for a couple of hours until I could get home to my next juice. Pine Root was exactly what I needed, it tastes mostly of beetroot and the sweetness it offered was a major mental relief for me. I knew my sugar cravings were completely a mental thing because in all honesty I don't consume that much of it, just the sensation of something sweet in my mouth soothed the crazy person in my head telling me I needed sugar. The rest of the night was a tough run, Pink Sherbert & Green Salad were not my favourites by far but since I hadn't been able to drink Alkaliser I knew it was important to get as much down as I could. I opted for another early night, again not being able to finish Sleep Well but I went to bed feeling full and satisfied. The last day is always the easiest, I woke up clear headed, full of energy and ready to take on the world! I was on my feet most of Thursday and drank pretty much everything except for the majority of Pink Sherbert. When it came time to drink Super Salad I was blown away, it was delicious and totally boosted my spirits throughout the rest of the day. I ended the night feeling a little rough but I had done a hell of a lot of work that day and I'd really have to say that I felt better than I usually would after a long day like that. The juice cleanse left me with the satisfaction and results that I was looking for. I was sleeping better, waking up feeling amazing, getting through the day with plenty of energy and my overall wellbeing felt like it was on point. To find out more about Schkinny Maninny you can check out their website here. Thank you to Schkinny Maninny for providing the opportunity to try out their Juice Cleanse! 1 comment on "Schkinny Maninny - Juice Cleanse | Experience & Review"